Football fans will be travelling to Anfield stadium from far and wide to watch Liverpool FC play Swansea City on January 21st. Both of these two premierships sides have everything to play for, as Swansea teeters on the edge of relegation and Liverpool fight for the League title top spot. With all this on the table, the game is guaranteed to be filled with excitement and surprises. If you’re a footie fanatic, you definitely won’t want to miss this one. So, head over to BetVictor Casino right now for your chance to win two tickets to this game and an impressive cash prize as well. There will be five incredibly lucky winners in this BetVictor prize draw. These winners will each come away with two tickets for the Liverpool FC v Swansea City match and £200 in cash. With all this on offer, why not make your way over to Betvictor right now and play for entries into this premier prize draw? Click to Play Now at BetVictor Casino Get £200 bonus + 200 spins 18+. New customers only. T&Cs apply. To take part in this competition, make sure you sign into BetVictor Casino between now and midnight on January 10th. The offer is open to all members of Betvictor, with no previous wager history required, so even if you’re not a member of the site yet, there’s still time. When you log into your account, you’ll be prompted to press the ‘Opt In’ button. It’s essential to opt in before you start depositing and playing. Once you’ve opted in to the prize draw, head over to BetVictor’s exclusive Liverpool FC slot- which we’ll tell you about in more detail in just a moment. Every £10 you stake on this slot will earn you one entry into the prize draw and there is no upper limit to how many times each player can enter. So keep on staking and spinning for a higher chance to be named a winner. The prize draw will then be held at 3pm on January 11th and five players picked from the pool of entries at random. 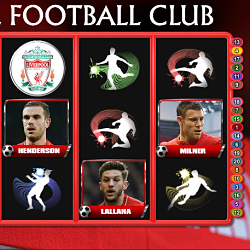 Liverpool FC is a sporty slot from Realistic Games which is totally exclusive to Betvictor. This game stands out for its high-quality graphics and symbols which include Liverpool players, the team badge and other iconic images. Don’t worry if you’re not an avid supporter though, as the high cash prizes and bonus features mean that this five reel, 20 pay line slot will appeal to any keen online gambler. This promotion runs from the 4th until the 10th of January. Only gameplay and money staked between these dates will qualify for the prize draw on January 11th. Every £10 staked in the Liverpool FC slot will count towards one prize draw entry. Please note that only real money wagered is eligible for the competition. The football tickets are non-exchangeable, non-transferrable and cannot be exchanged for a cash alternative. It’s important to note that travel costs and other expenses on the day of the match will not be covered by this prize. It is essential that BetVictor has your correct and current contact details on file as all winners will be contacted by the casino. Any winner who remains uncontactable after 48 hours of the prize draw being held will have their reward revoked and another winner will be named.